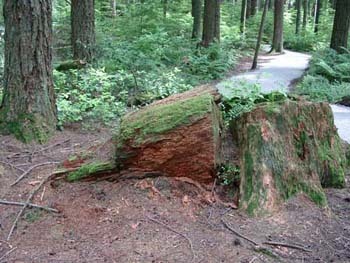 The second growth forest site is located in the Pacific Spirit Park (49° 15′ N, 123° 14′ W). The site was not logged since the late 1800s, was allowed to regenerate naturally, and has experienced minimal development aside from the creation of trails and paths through the forest. There were many fires that impacted the area, some minor and localized as logging operations continued and two major fires in 1886 and 1919, which affected the second growth forest site. This site is characterized by plants that typify the Coastal Western hemlock biogeoclimatic zone. The dominant tree species are Western red cedar, Douglas-fir, and western hemlock. The site is characterized by hummocky microtopography created by windthrow. Many different microsite characteristics are evident in this portion of the UEL. For example, some areas are wetter than others and support plants like foamflower.